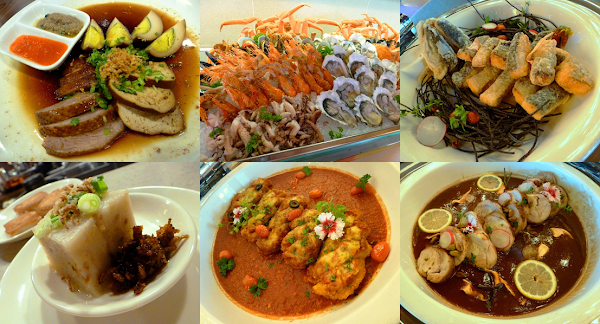 Wembley Cafe is one of the few hotel restaurants in Penang which offer buffet lunch and dinner on a daily basis. Located on Level 2 of The Wembley, the restaurant introduces a different theme each day of the week. For example, Mediterranean cuisine is served on Tuesdays, while tantalizing Thai delicacies are featured on Wednesdays. As for Saturday evenings, the theme is revised from month to month. Throughout the month of October 2016, the buffet dinner is called "The Wembley Chef's Signature Dishes Night". This menu features chefs' signature delicacies such as Chef Peng's Canapés. Presented here are smoked salmon with sturgeon caviar, and camembert cheese with tomato and olives. The "Seafood On Ice" section consists of an assortment of marine harvest such as snow crabs, flower crabs, tiger prawns, oysters, mussels and octopus. Seafood is either raw or boiled without seasoning. This is where condiments such as spicy cocktail sauce, Oriental dressing and Tabasco sauce come in. As for sashimi (刺身), three of the most popular fishes are used: salmon (サーモン), tuna (マグロ) and butterfish (白マグロ). I would like to suggest that sashimi should be served over ice so that the flesh remains chilled and firm. Moving on to sushi (寿司), there are over a dozen types of nigiri (握り) and gunkan (軍艦) variants with different toppings. Sushi is customarily enjoyed with wasabi (山葵), pickled ginger (ガリ) and soy sauce (醤油). Lor Ark (卤鸭), or braised duck, is also on today's menu. Compared to chicken, duck has arguably sweeter flavor when cooked properly. Bean curd and soy eggs are also available. Light sprinkle of fried garlic helps to accentuate the duck's savory flavors. Chili sauce and ginger sauce serve as condiments; the latter is particularly appetizing. Should diners prefer, congee (porridge) is also provided to consume with Lor Ark. Radish cake (萝卜糕) is a new item on the menu. The "cake" is made from a mixture of rice flour and shredded daikon, which is steamed and then left out for 2 days for it to "set". There are several ways to cook radish cake; Pan-Fried Radish Cake is one. Thick slabs of radish cake are lightly fried on both sides until the surface becomes crispy. Steamed Radish Cake is also available. I recommend adding Chef Owen's signature crispy XO sauce for enhanced flavor. As for the radish cake itself, I personally prefer proportionately more daikon so that the "cake" feels "denser". On the other hand, I feel that Deep-Fried Salmon With Pickled Lettuce Dip is masterfully prepared. Salmon fillets are deep-fried to golden perfection. Fortunately, this dish is devoid of unpleasant oiliness that is often associated with fried foodstuff. Another scrumptious dish is Wok-Fried Clam With Spicy Bean Paste. Clams are usually cooked with seasoning as they lack intrinsic flavors. For this dish, doubanjiang (豆瓣酱) carries sweet-savoriness to delight my palate. Mantis Shrimp With Salted Egg is another highlight this evening. I love the crispy mouthfeel and appetizing taste of the salted egg coating. As evidence of its popularity, this dish is often depleted and needs to be replenished from time to time. Wok-Fried Prawns With Bisnori is one of Wembley Cafe's signature dishes. After being fried in hot oil, the large shrimps are tossed with "bisnori" seasoning. "Bisnori" is an invented word that is combined from "biscuit" and "nori" (海苔). Bisnori seasoning comprises of crackers, edible kelp, spices and sugar. Still on the topic of shellfish, there is Oyster Gratin With Curry Cream. Somehow, I still prefer raw oysters over baked ones. Also present in the seafood department is Turmeric Linguine With Mussels & Scallop. The pasta is best enjoyed while it is still warm; otherwise linguine becomes too firm when it is cold. Moving on to poultry, Pumpkin Parmigiana is the first to catch my attention. Parmigiana is made from breaded chicken cutlet, deep-fried until it turns crispy. The cutlet is served with molten cheese and tomato sauce, as well as light sprinkle of herbs to improve aroma. I find the Duck Ragout With Pappardelle quite intriguing. In this French-Italian dish, duck chunks are slow-cooked with a variety of spices and in thick gravy. Ragout is also served with pappardelle, a type of flat pasta originally from Tuscany. Pappardelle is substantially broader than fettuccine and is nearly an inch wide. One of my shortlisted favorites this evening is Lavender Chicken Roulade With Camembert Pistachio. Here, deboned chicken breast is rolled around camembert cheese and chopped pistachio. Roulade is braised in lavender-flavored gravy and then sliced into rounds before serving. Diners who take beef should also try some Smoked Medallions Of Beef With Chestnut & Tarragon Sauce. The beef is lightly smoked so that the center remains pink and juicy. Meanwhile, the creamy sauce complements well with the beef slices. I highly recommend Chicken, Leek & Mushroom Pot Pies. Each pie is served in a teacup and is covered with flaky puff pastry. Pie fillings consist of chicken chunks, mushrooms and a variety of herbs in a creamy consistency. The dishes so far tend to be meat-centric. Therefore, it is worthwhile to have some Garden Salad as counterbalance. There are leafy vegetables such as lollo rosso, frisée, oakleaf and butterhead. Croutons, raisins and a handful of salad dressings are also provided. Meanwhile, the desserts section has seen significant improvement since my previous visit. There is now a wider range of French pastries such as mille-feuille. The large number of goodies should be able to pacify one's sweet tooth. Speaking of sweet tooth, several types of jellies and puddings are also available. In particular, I like the Osmanthus & Wolfberry Jelly. However, I think it is important to keep the jelly chilled because it tends to "melt" when exposed to ambient temperature. Tang Yuan (汤圆) is a traditional Chinese delicacy that is often associated with winter solstice (冬至) celebration. There are several flavors of glutinous rice balls cooked in ginger-infused syrup. The rice balls may or may not have fillings of their own. Chocolate lovers should be thrilled to know that the buffet spread includes chocolate fondue too. Items like marshmallow and apricots are provided to be dipped into the hot chocolate sauce. Last but not least, there are also a handful of fruit varieties for diners to conclude the feast. Fresh cut fruits today are pitaya (dragon fruit), oranges, honeydew, watermelon and plums. Wembley Cafe's buffet dinner is served from 7:00pm to 10:00pm daily. On weekends, the buffet is priced at RM108.00 for adult, RM54.00 for child and RM76.00 for senior citizen (net prices). For each week in the month of October 2016, there is a raffle where the lucky diner wins a complementary buffet dinner voucher for two persons. Directions: The Wembley is located at Magazine Road (Jalan Magazine), just opposite of Hotel Jen. Wembley Cafe is located at Level 2 of the hotel. There is a multilevel parking garage at the hotel. Patrons to Wembley Cafe can get their parking tickets validated for a flat rate of RM6.00 per entry.